Easy step by step instructions you can achieve stunning results with...PDF ebook Format. Instant download.Click on the book cover above for photos and details. 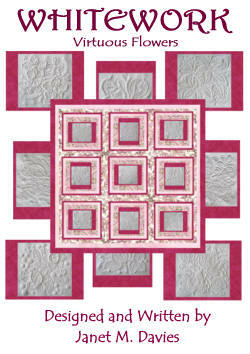 Similar to Irish Mountmellick Needlework. But more stylistic. This Printed book is no longer available. But you can buy the individual designs from this book. 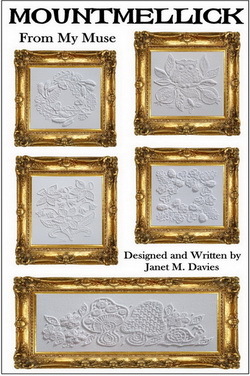 Irish Needlework style with easy traditional stitches.This Printed book is no longer available. But you can buy the individual designs from this book. This Printed book is no longer available. Padded and Wired Embroidery from Europe. This Printed book is no longer available. But you can buy the individual designs from this book. A contempory look at this Pulled and Drawn style of Needlework from Germany. This Printed book is no longer avalable.But you can buy some of the individual designs from this book. Please note that when books are no longer in print that does not mean they have no copyright to them any more. Full copyright still applies on the book or parts of that book for decades to follow.